With the Mainstays 8-Cube Bookcase, arranging the perfect library in an elegant style to match almost any room is simple with its modern design that is available in white or espresso finishes. 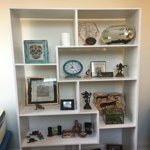 This sturdy storage unit features an open-back construction and an intricate geometric style for eight divided storage and display areas. 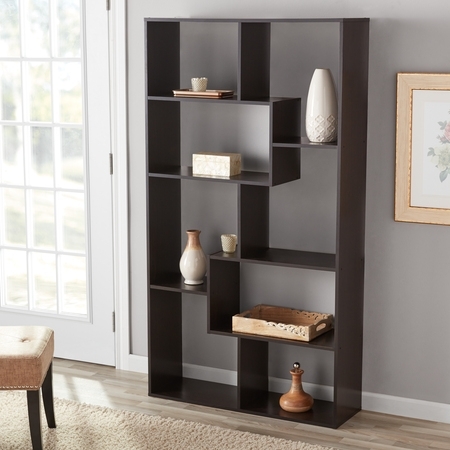 Easy, two-person assembly helps make this attractive bookshelf a useful and functional conversation piece in any living room, family room, or den. The Mainstays 8-Cube stands an impressive 68.5 inches tall for displaying an expansive library in large and medium sized rooms where smart, efficient storage is a priority. 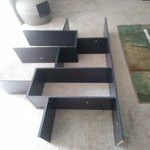 The eight geometric spaces create a smart and stylish design for books, photo albums, vinyl records, DVDs, CDs, and more to deliver a functional bookcase that is perfect for large and medium collections. 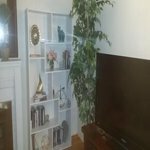 This well-designed storage unit can also be used for displaying photography, artwork, collectibles, Mainstays baskets, houseplants, or for simply keeping much needed items at hand for easy access. I actually got this product on sale and it has exceeded my expectations. You need patience when putting it together and recommend using a electric screw driver because there are a lot of screws. 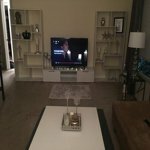 I also recommend using the included wall mounts if it will be placed on carpet. The units were easy to assemble! They look just as described. I wish the screws were capped white or a cover was included but over all a great piece! For only 40 dollars this is a beautiful display and is bigger then I expected it! Can't complain for the price I paid. Serves the purpose perfectly. For what I paid (forty on sale) this thing is amazing. I really love the height, the color, the overall size, and the asymmetrical design. It's not incredibly sturdy, but I never planned to use it for books. The finish isn't perfect, either. Please note that the package weighs 72 pounds! FedEx would not even carry it up the six steps to my porch. I put it together by myself, with no power tools. The instructions are straightforward and every piece has a letter on it that corresponds with the pictures. It took maybe two hours and was actually a fun challenge - like a puzzle! In short, it's a great value for the price, and exactly what I needed. If you want something that looks high-end, this is not the bookcase for you. But I love it. Great packaging. Just a small scrape on the corner of a piece of wood but nothing major. Very easy to assemble! You don't need two people. One person can do it. I did it and I'm only 5'1. Rich in color-just dust to clean and looks beautiful! I purchased mine on Friday and it arrived on Monday. It arrived very well packed not a piece was missing and had one extra dowel. Took me and my two daughters ages 12 & 14, one hour to build. Nothing but dowels, screws and tap screws. You could use an electric drill to make it go faster but we used a hand phillips screwdriver. Directions were exactly as stated. Looks great for the price! 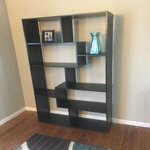 This is a good bookcase for the price. It came on time and was well packaged. No damaged pieces and everything was included. It was very easy to assemble. Although I knew the measurements, in the area where I have it, it looks a little shorter than I expected, but it still looks good. 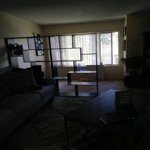 I'm actually thinking of buying another one and putting it on the other side of my TV stand to create an entertainment area. We bought 2: One arrived broken, One looks great! 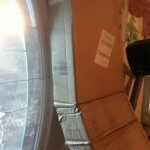 The long side boards were cracked on delivery, don't accept your box if it arrives like my picture. 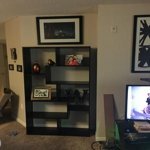 We bought two shelving units. We had to haul the 70 lb broken box back to the store. The other I got together in 45 minutes. Once we unpacked and organized, it was super easy to assemble. The shelf is a lovely addition, looks sharp and clean. Did need more stickers to cover screw holes. 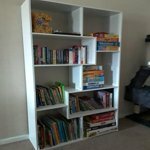 I bought two of these book cases to divide my studio space into a living and bedroom space.The boxes were pretty heavy, I picked up the boxes in store and had to carry them to my apartment all by myself. I put these together and after doing the first one the second one was a breeze. I think you should start by putting in all the wooden peg things, then putting the pieces together, followed by putting the screws in. I did this all manually but I think using a power tool in a LOW setting will be very helpful if you are putting them together by your self. My hands were so achy half way through!! 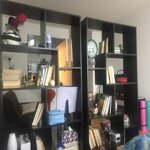 Otherwise these are very stylish and the bookshelves are really cute and are different from the square ones that they will sell at ikea for tripple the price! They are about 5'6 ft standing. Its not really wood and it can be a little flimsy if you nudge them too hard. I have them up on a carpet they are not bolted to my wall, I do not have children so it is safe for me. They are very cute and for the price paid the quality is worth it!